This page is about the aircraft F4U-1A (USMC). For other uses, see F4U (Family). The F4U-1A (USMC) Corsair is a rank II American naval fighter with a battle rating of 3.0 (AB) and 3.3 (RB/SB). 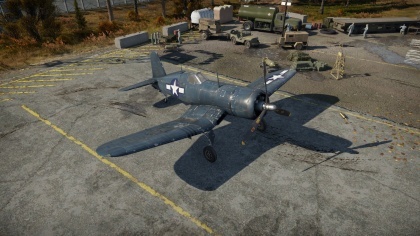 This aircraft was introduced in Update 1.39. Due to it's great energy retention and high dive speed, the Corsair is very good at Boom and Zooming. It is recommended to be used this way especially against any Japanese planes. Against any German planes BnZ is still recommended, but some planes you can out turn (FW-190 A-4). 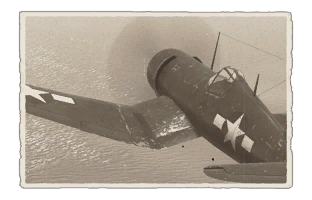 As with every American fighter, always climb at the start of a match. The only way to be successful with this plane is to climb high and end up higher than the enemy. Using this tactic will greatly increase your chances of getting the enemy and forcing the enemy down low where you can finish them off. The single-engine Chance Vought F4U Corsair was designed in 1938 for a U.S. Navy single-seater carrier-based fighter competition. This aircraft was designed from the outset as a carrier borne fighter. It featured an inverted gull wing to keep the huge propeller off the ground while keeping the landing gear short for carrier operations. Even after the completion and launch of the F4U-1, a number of problems were discovered which initially prevented the aircraft from being used as a carrier-based fighter such as bad stall characteristics due to the gull wing, no visibility over the nose for carrier landings and bouncing off the deck after landing. The Navy was forced to use the first F4U-1s for Marine Corps ground-based operations until January 1945 when most of these problems were overcome. In the middle of 1943, the F4U-1A variant made its debut. To improve visibility, which was especially important when landing on an aircraft carrier, the cockpit canopy was modified to a convex shape, and the pilot’s chair was raised 17.8 cm. Dive speed problems were solved with a stall strip just outboard of the gun ports on the starboard wing’s leading edge. The F4U-1A was produced not only at the Chance Vought factory, where the aircraft was designed, but also at the Brewster and Goodyear factories (with the designations F3A-1A and FG-1A, respectively). The latter model differed in that its wings were not folding. The Chance Vought factory produced a total of 2126 F4U-1As.